Historic Context: Roadside development structure, constructed by the WPA. Status: Intact, closed to the public. Access: None, visible on I-35 northbound, or from Skyline Parkway - take the Boundary Avenue exit and follow the signs to the rest area, but continue past the rest area entrance on Skyline Parkway to the overlook on the south side of the road. 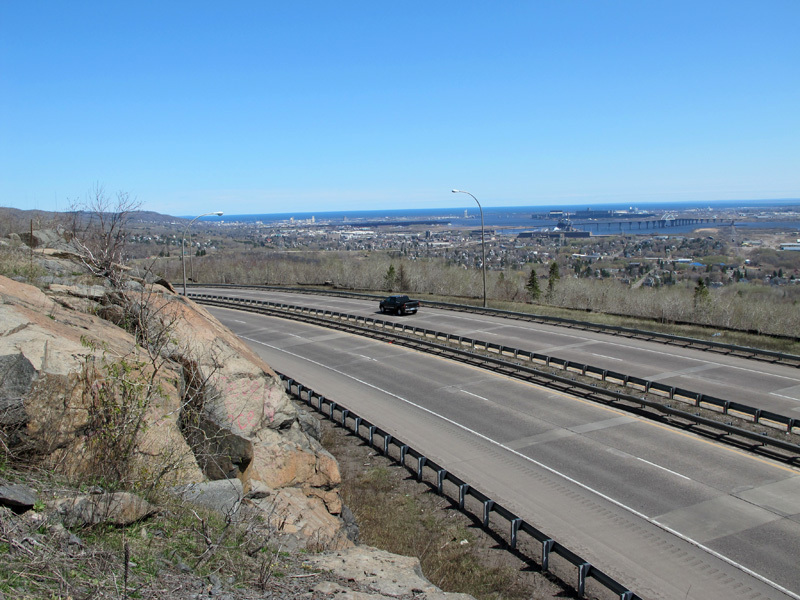 Hiding in plain sight along I-35 on the west side of Duluth is the stone railing of the old Thompson Hill Overlook. It was constructed in 1938 as part of a WPA project to improve Highway 61 on the Thompson Hill. It survived both the 1957 project that widened the highway to 4 lanes, and the 1967 project that rebuilt it into I-35. Sadly, the construction of the freeway permanently closed the historic overlook to the public. However, it is still viewable from Skyline Drive. 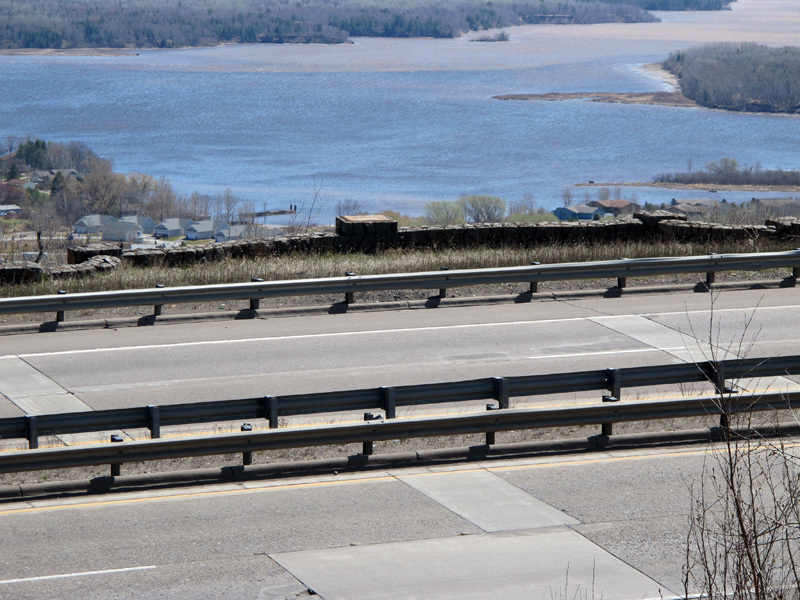 The overlook railing is actually the top of a large stone retaining wall that was built to support Highway 61 and later I-35. Its south face (not visible) is between 8 and 13 feet high. 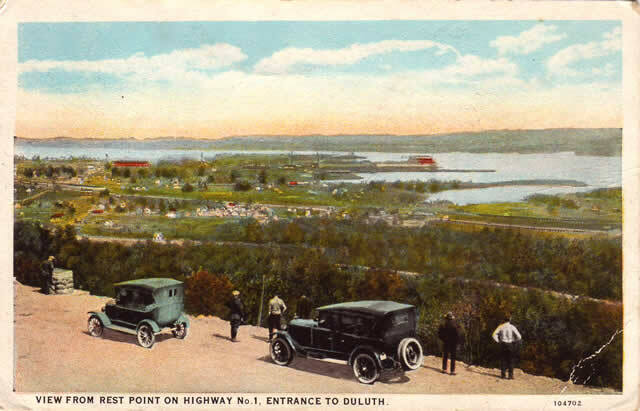 Towards its north end is a large overlook bay that once provided views of Duluth harbor. It also held a geologic marker, added in 1955. 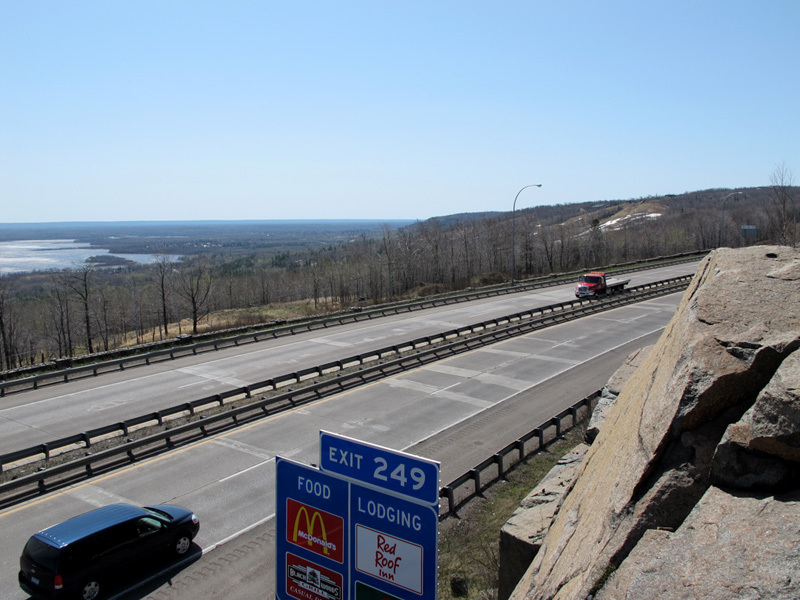 The MnDOT roadside inventory report for the overlook is full of historical inaccuracies. It states that the overlook was built as part of a reconstruction of the highway. However, the new grade shown on the construction plans was not built, and does not show up on later aerial photos or the plans for the 1956/57 4-lane upgrade project. It appears the work done by the WPA was limited to drainage and roadside improvements. 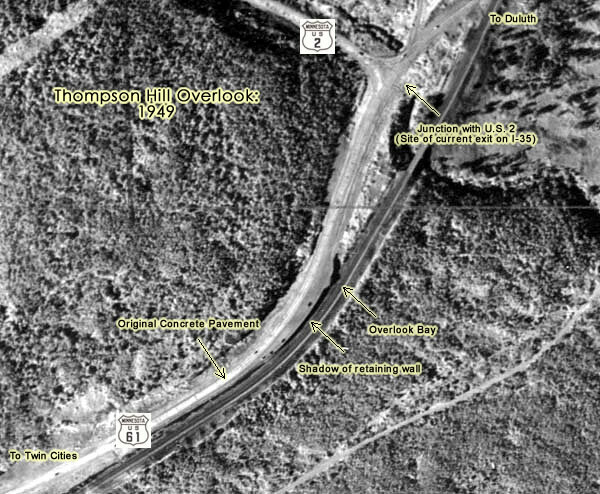 The report even goes as far as to state that Skyline Drive above the site is an older alignment of Highway 61 - aerial photos from 1949 show that it didn't even exist at the time. Aerial photo from 1949, showing the overlook in its heyday. Note how Skyline Drive doesn't even exist above the overlook. The same location today, showing the much enlarged road and rest facilities. Photos - taken in April, 2010. Looking southwest from Skyline Parkway, the stone railing is clearly visible along I-35. Another view from Skyline Parkway, this time looking northeast towards Duluth and Lake Superior. The viewing bay is visible just ahead of the truck. A close-up of the overlook bay . A geologic plaque was once attached to the pedestal in the middle (the MnDOT roadside inventory report states that the plaque was removed and may be in storage). What is likely the view from the same site before the construction of the stone wall in 1938. Note what appears to be a geologic marker on the far left (being read by a man). Also note how the highway is called "No. 1", referring to U.S. 61's predecessor, State Route 1. 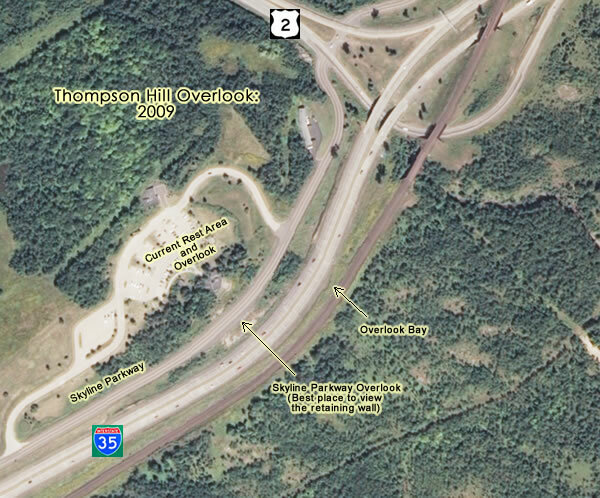 MNDOT Historic Roadside Development Structures	Inventory: Thompson Hill Overlook. Accessed May 28, 2011. Construction Plan: Details For Parking Overlook on Thompson Hill - Duluth, July, 1937 , revised Nov 1937. S.P. 6924-01. Construction Plan: Trunk Highway No. 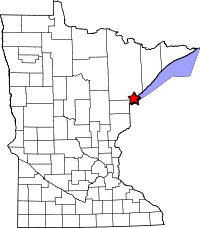 61=103 In Duluth, State Project 61=103-28, September 15, 1938. Right-of-Way Map 179-39A: TH 61 From West Limits of Duluth to 58th Ave West.